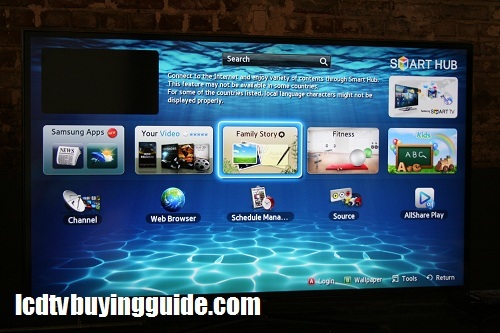 The 2012 model of Samsung PN51E7000 is one very sharp TV. 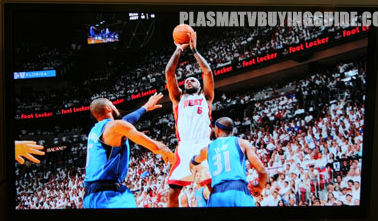 The picture quality and black levels will blow you away while we do recommend reserving this TV for darker light rooms. It's a great TV for those with a large living room space as long as you do not have tons of bright light coming in from windows. This TV is not meant to get that bright. There is some very good anti glare louvered screen technology in this TV. It actually absorbs the light without allowing it to escape. Apparently, energy costs are the reason Samsung and other plasma manufacturers have cut their contrast with normal picture settings. They key is being able to ramp up the color and phosphor output through the white balance controls and unfortunately this Samsung plasma does not give us that ability. Still, it's an awesome picture both in HD, SD, and 3D. And the prices are right. The E7000 series plasma televisions come equipped with the new All Black Pure Filter, this is new technology from Samsung that is available exclusively in it's top tier plasmas. This 2012 technology improves black levels and contrast by 10% over previous models. Higher contrast and black levels not only means darker blacks it also means improved color performance. One area that we like the Samsung top plasma panels better than the Panasonics is their smoother picture transitions and signal processing. If you were standing in the store looking at this TV side by side next to an LED TV set on Dynamic Picture Mode (peak brightness) you might think this was the dimmest TV you had ever seen. However, if you took the same TVs and put them in almost almost dark room, you would think this TV had one of the best pictures you had ever seen. Since video-files generally consider black levels and darker rooms the correct ambiance for TV and movie watching, the E7000 series gets a high score. Black levels are very saturated as the picture above shows. You cant even tell where the black borders begin! Great black levels cause colors to pop more, thus giving you more picture depth. 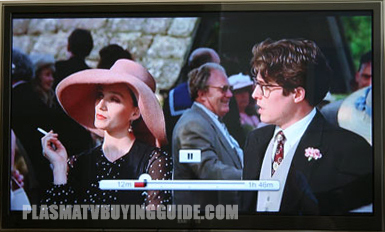 The overall contrast ratio is not high on this TV due to the restricted contrast and peak whites. Realistic colors have always been a high point on Samsung's plasma televisions and with the new All Black Pure Filter the E7000 continues that. Colors on the PN51E7000 look like you would expect them to if you saw them off the screen, there is none of the over saturated look you find in many of today's LED and LCD televisions. SOme viewers may feel that the colors are a bit muted on the E7000 but we were quite impressed with them. 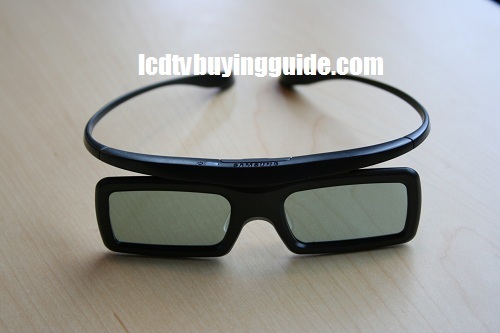 The active 3D on the PN51E7000 is impressive, Samsung has improved the 3D performance on their televisions again in 2012 and paired with the new, light weight 3D glasses it is very immersive. There isn't any of the blurring or flashing we noticed in older models, colors pop, there is plenty of depth and the full HD detail really shows. The PN51E7000 is only one inch in depth, thin for a plasma. The bezel is about 1" wide and is a charcoal gray color, the matte brushed metal look will not distract while watching movies or TV. 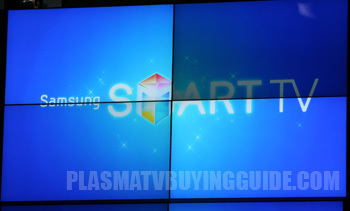 The E7000 comes equipped with Samsung's newly expanded Smart TV suite for 2012. The app store has grown to 1500 apps this year and it continues to grow. We've done a very thorough examination of the Samsung Smart Hub Review which you can read here. Samsung's is the most thorough and highest rated of all the Smart TVs (Internet options) even though it does have its negatives such as slow load times for some Apps and limited memory and very slow browsing on the web browser. Three strong negatives and it is still the best. There is a dual core processor included that is supposed to help with load times on Apps and allow you to use other functions at the same time, but it's still very slow from my perspective. Download apps to stream video from major providers like Hulu and Netflix, get news, sports, financial and weather updates or access you Facebook or Twitter acount directly from your television. The new dual core processor built into the PN51E7000 allows you to multitask on your television. Keep your TV program on one part of the screen and use an app or the built in web browser on the other part. The E7000 also comes equipped with built in WiFi for easy connection to your home network. The menu system in the E7000 series is one of the best for 2012/2013. It's easy to use and I think better than last years. The remote is a standard backlit remote with obvious keys for the Smart Hub and other functions. Got a darker room environment and need a great TV? This is a super choice from a value perspective. The Samsung PN51E7000 sells for $1400 and your not paying extra for Smart Interaction features that would go seldom used. It's a couple hundred dollars less than the Panasonic TC-P50GT50. Another competitor is the LG 50LM6700. 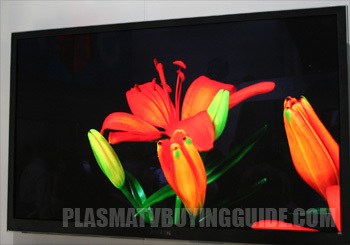 LED TVs will cost more and there is only one in the 50 inch size the Toshiba 50L5200U. 47.0" x 28.1" x 1.9"
The following video is of the D7000 series Samsung plasma from 2011, however we have reviewed the E7000 series hands on and feel picture quality characteristics and most features are very similar or the same as the D7000 series.